I have really missed my blog and I have really missed my little updates. 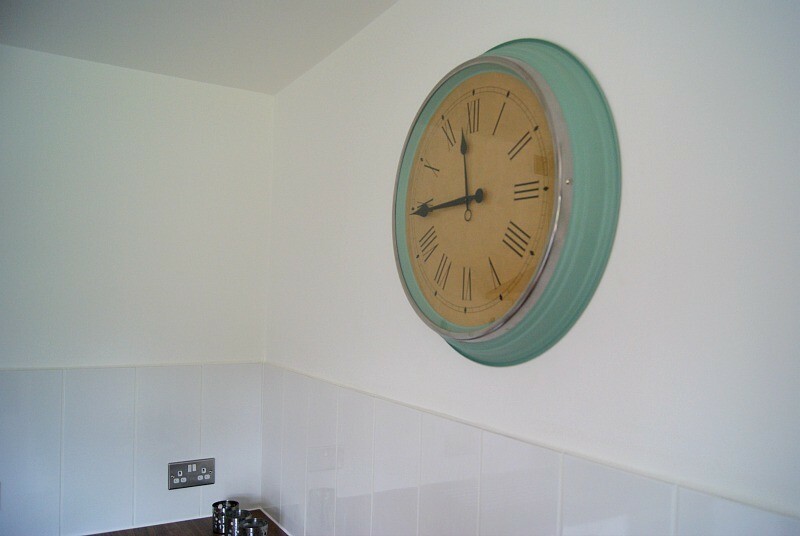 I have not had a lot of time recently, as we have been redesigning our kitchen. It seems like everything has been at some sort of standstill while we went full steam ahead with the kitchen. All my husbands efforts have gone on that and all my efforts to the children. So there has been little to no time at all for me to do any blogging what so ever. But I am now pleased to say more than anything that our new kitchen is complete. And not only that but our home is starting to feel a lot like our home now. The kitchen took a lot of hard work, more than I think my husband and I expected. But you know that feeling you get when your hopes and dreams come true? When I walk into my kitchen I almost feel like I am dreaming, because this is the exact kitchen if not better that I wished for and thought about for so long. 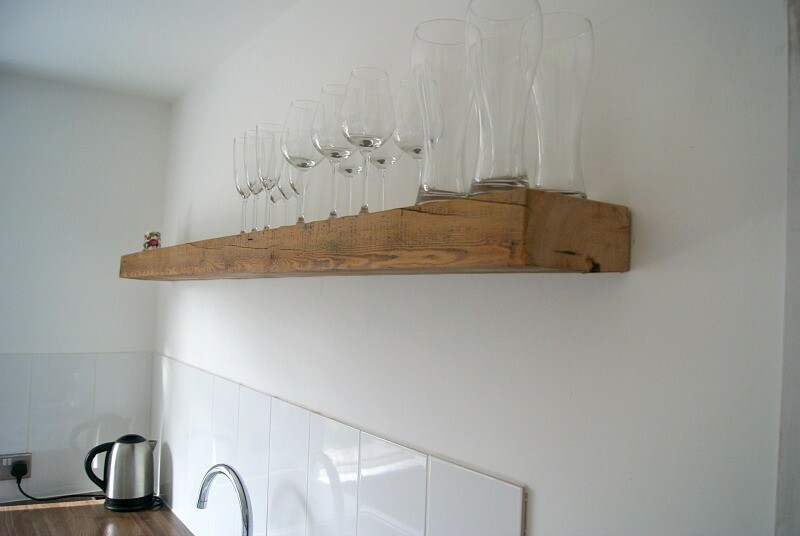 I love it so much, I love the white, I love the wooden accents, the oak beam my husband created himself. And all the space. Most of all I love the space. And the fact that it is white, that helps a lot too. I love white probably a little too much, my husband does too! Thankfully we have very similar tastes in decor. We started this project on the 8th of October and we have just finished on Sunday, which was the 15th of November. Honestly, as my husband did this alone along with working full time and working two weekends I think he did amazingly, especially to get this finished so soon. And I am so extremely grateful that he put in all the effort that he did. He is already keen to start the next project, but I think we just need Christmas to regroup and get back to our normal family evenings and routines. The only thing that we now need to get is a new dinning room table. I have seen one I like, it’s from Ebay and I think a really good price too. Our kitchen is from Homebase. It is the simply Hygena range. 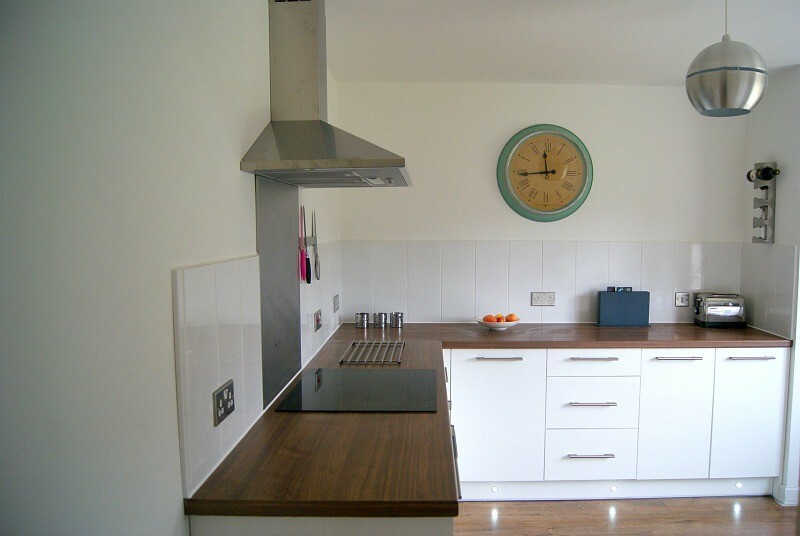 Our kitchen was under £1000 brand new believe it or not! The appliances were all purchased separately. 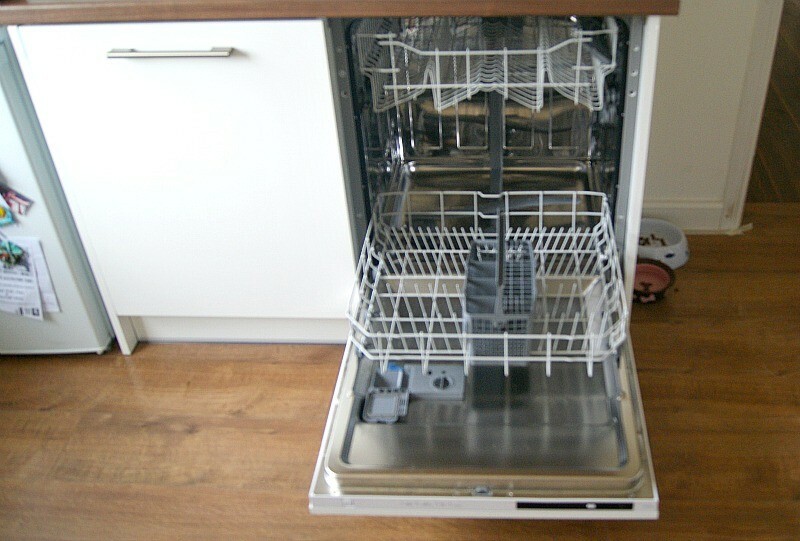 We have an integrated dishwasher which I am so excited about as I have never had one. I have never seen my glasses so clean and my pots so shiny! Our kitchen has 8 cabinets, one of which a drawer cabinet. We decided on this layout without any wall cabinets to create the illusion of more space and open up the room more. Thanks to our lovely neighbour who suggested this to us. 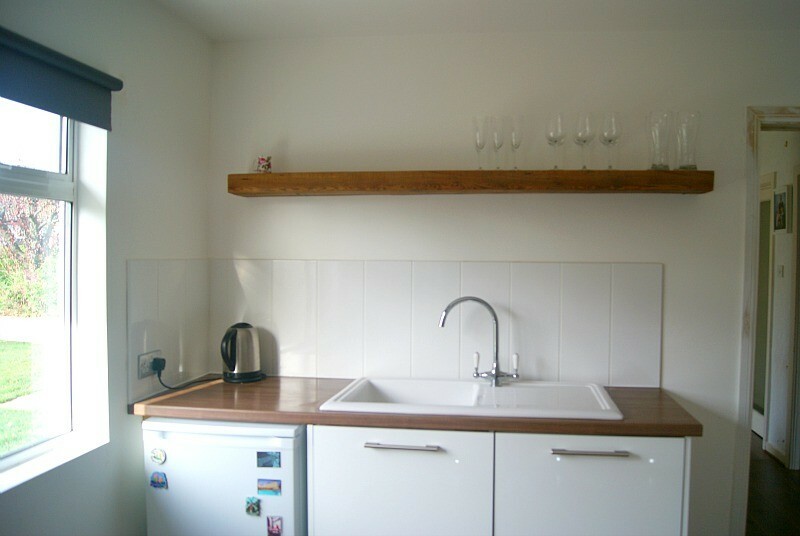 We have just enough room thanks to the oak beam above the sink. We might put a further two beams, probably smaller on the other side of the wall for a little more space. But we will see. So far we are very happy with it all and how it looks. We have been known to just stand in there in the evenings and look at it all. Take it all in. It does seem so surreal. Its seems as though it was done in no time now that it is all done. I am so pleased and I am so extremely proud of my husband. He did the whole thing himself. He managed to make my vision a reality and I am so very thankful. 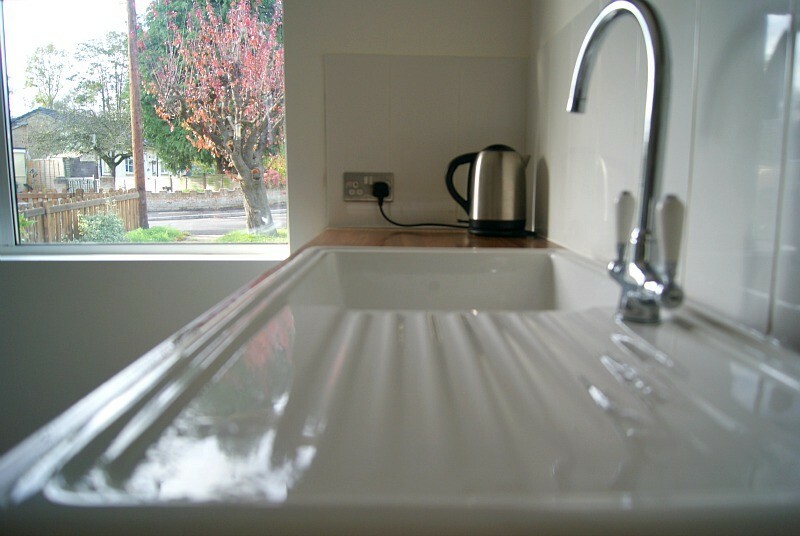 I absolutely love my ceramic sink and have used it for a while now I cant remember exactly when my husband put it in for me to use, but I have used it properly for about 2 weeks now and I cant complain. It is really deep so you can get a lot of water in there if you want to soak your pots. I am going to be writing a full review on it soon if you are interested inreading that. I hope you have enjoyed the little tour around our new kitchen. 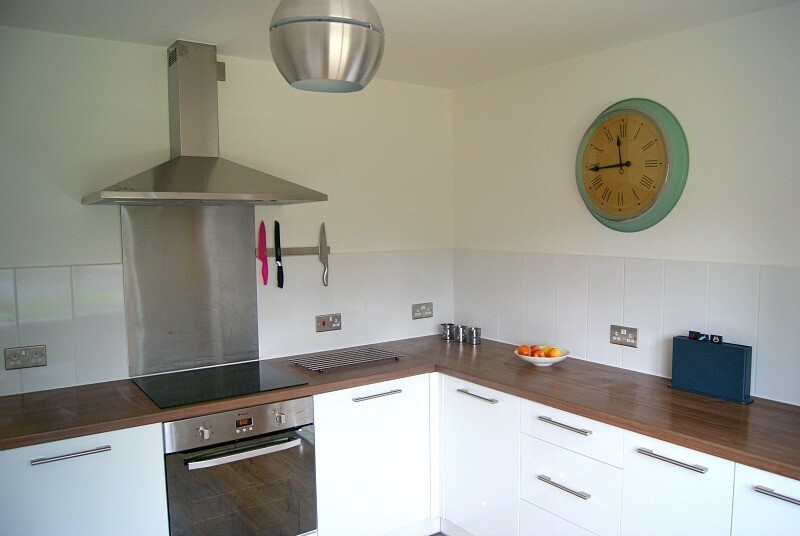 But I don’t think it would be quite as beautiful or complete if I didn’t show you the kitchen before its makeover. I didn’t take any photos but I did document the whole journey on video. I have put together a little montage of all the stages. Where we came from to the finished kitchen. I hope you enjoy it. Thank you for reading! 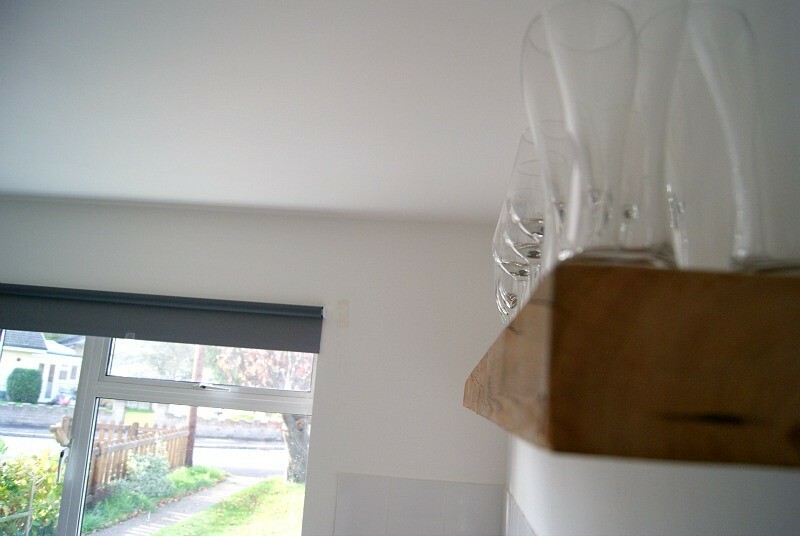 Oh I love it too:) Especially the beam designed by your hubby, it really sets off the kitchen. I only wish mine looked so tidy!! Oh wow this is heavenly! This is exactly what I would want my kitchen to look like if I could design it myself. We’re in rented at the moment though so will be a few years before I get the chance! Donna recently posted…Celebrating Special Pets with PetPlan’s #PraiseYourPet Competition! Great kitchen. I love the top part of it. Our one is black and it’s that kind of material where when you don’t wipe it away properly you can see it still through the light. But the kitchen came with the house and it’s only 7 years old. I got used to it at this stage. But that kind of top I would love to have even though I don’t even like to stand in the kItchen for long.